It’s mid-September. You’ve yet to take the kids trick-or-treating, and you certainly haven’t thought about cooking the Thanksgiving turkey, but Christmas decorations are already on display and holiday commercials have begun. No, you didn’t miss Halloween and Thanksgiving. Christmas shopping is starting early this year. At NerdWallet Shopping and DealFinder, we’re making our Christmas list early to help you start your holiday shopping – and saving – today. With more than two months to go before the busiest retail season of the year begins, an impressive 20% of Americans have already begun Christmas shopping, according to TODAY Money. This figure is expected to reach 40% by Halloween. Stores across the country have seen this consumer demand and are starting to capitalize on the early holiday spirit. In fact, major discount retail store chain Kmart aired its first festive “not a Christmas commercial” TV ad of the 2014 holiday season – just a few days after Labor Day. The spot highlighted the store’s layaway feature. And just this week, Target revealed its list of the top holiday toys that are sure to be a hit with kids. Making the cut this year are movie-inspired products, such as the Disney Frozen My Size Elsa and Anna Dolls and a Teenage Mutant Ninja Turtles Secret Sewer Lair Playset. Also featured are the Razor Lighted Wheel Scooter and the FurReal Friends Get Up and GoGo Walking Pup Set. In coordination with the debut of their toy list, Target also announced a new line of boutique brand toys that are available online and in stores. These particular products, according to Target, are designed to promote child development by inspiring discovery, exploration and imagination. They include play sets, wooden toys and science kits. With an ever-increasing number of retailers competing for your attention (and money) so early, how can you become a savvy September Christmas shopper? If you start shopping early, you will have more time to look for the perfect gift and, more importantly, more time to compare product prices. You’ll also be able to snag your must-have items before the products sell out. Retailers expect you to spend around $536 on gifts this year, according to a prediction from the National Retail Federation. Avoid overspending by setting a budget. If you start shopping early, keep track of your purchases so you don’t shop more in December and realize that you bought more than you can afford. Deciding where to make a purchase this year may likely be more a matter of what the store has to offer you than what the product does. A popular trend this season seems to be layaway, a service in which you can reserve a product and make payments on it before receiving it. Kmart rolled out a limited-time layaway option with no down payment, and Toys “R” Us now offers online layaway. If you want to manage your spending by paying off products before you bring them home, look for stores with convenient layaway options. Prioritize which gifts you should buy now and which you can wait on. If you shop now, you can take advantage of ongoing back-to-school and end-of-summer sales on office supplies, outdoor living essentials and more. For products such as electronics and fall clothing, you’d probably be better off waiting for Black Friday deals. Wrap up your shopping early so you can have more Christmas spirit and less mid-December stress. Schedule your shopping right and you can save both time and money. So, if you’ve already decided what you intend to buy for those special people on your list – and you definitely don’t want to be one of those procrastinators who has to endure the Christmas Eve melee – consider joining the 20% of Americans who have started their Christmas shopping in September. No one said you have to start wrapping yet. 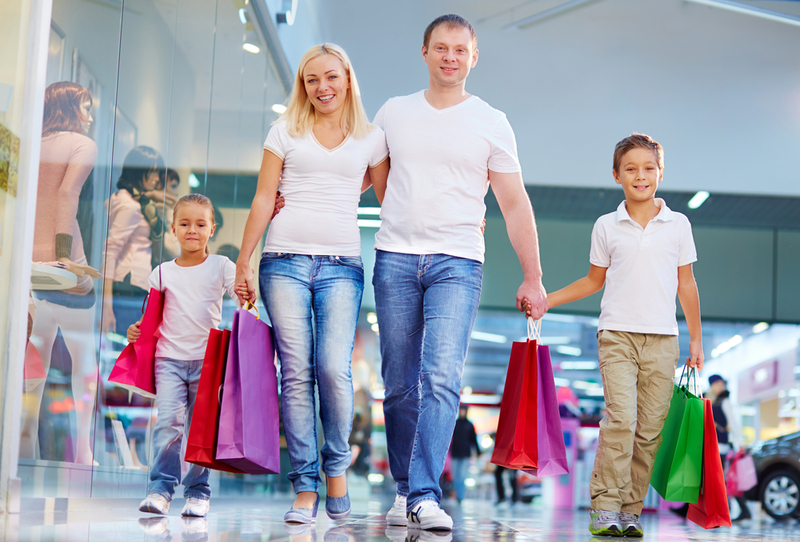 Shoppers in short sleeves photo via Shutterstock.